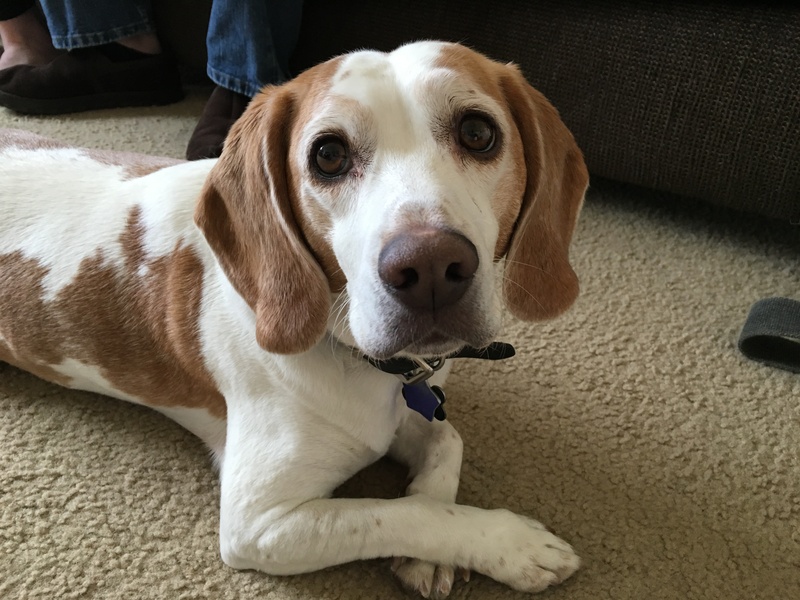 Zeik is a six-year-old Beagle / Basset mix who barks a lot, gets anxious and freaks out when left alone. He also nips, barks and bites some guests. I got a first hand lesson in Zeik’s door behavior when I arrived for the session. Knowing his proclivity to bite and nip guests, I had asked his guardians to have him on a leash prior to my arrival. While a leash is a helpful tool when it comes to controlling your dog, its important to use it correctly which is why I offered the guardian some advise about how to react when Zeik acts out at the door. Security is typically a job handled by the top dog in a dog pack. So the fact that Zeik was reacting this way tells me that he thinks he is in a position of authority in his home. I asked his guardians about the rules, boundaries and limits that were in place to get a feel for his day to day routine. After finding out Zeik didnt have many rules in place, I discovered another contributing factor; his guardians petted him whenever the dog demanded it. When you have a dog with few rules who gets a response from a human when he gives them an order, its not a stretch to think the dog will gravitate to a leadership position in his mind. After all, if you did anything you wanted at work and could tell the boss to pay you whenever you wanted, would you be a very good employee? Another great way to develop a healthy leader follower dynamic is to teach a dog to walk calmly in a heel position. Now teaching a dog to heel is training and not behavior, but I do have some tricks up my sleeve that I accumulated over the years, so we headed out on a walk. By using a Martingale collar with the special twist of the leash, we were able to stop most of Zeik’s pulling right away. His guardians will need to work not he timing of their corrections and be sure to remove all tension from the leash as soon as they finish the correction. Also practicing putting the dog into a sitting position when their are no distractions around will help prepare the dog to repeat the action in more demanding situations. Halfway through the video, Zeik started to react to a nearby neighbors dog which gave me an opportunity to show them how to apply some simple counter conditioning. After returning from the walk, I wanted to repeat the door exercise to see how Zeik’s guardians did with applying the techniques and exercises we had gone over in the session. Although Zeik’s barking was about the same, his behavior was very different. It was great to see the dog staying behind the new boundary on his own. With some practice at this exercise, Zeik will learn to stay back and let the door greeting duties to his guardians. By the end of the session, Zeik was listening better, following commands quicker and showing more respect for his guardians. While Zeik is not a passive dog, his behaviors can absolutely be changed. It will be important for his guardians to enforce the new rules right away and practice the exercises ad techniques I showed them in the session for Zeik’s new behavior to become permanent.